(W) Dan Abnett (A) Scot Eaton, Wayne Faucher (CA) Brad Walker, Andrew Hennessy. UNSTOPPABLE part one! 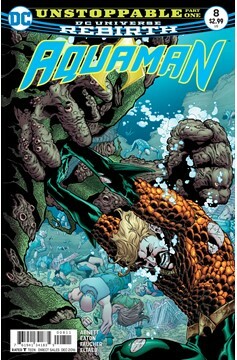 Arthurs investigation into the mysterious Atlantean terrorist attacks on the surface is cut short when Black Manta taps his newfound weapons cache and unleashes an unstoppable weapon upon the undersea kingdom: a relentless behemoth from the deep that lays waste to anything in its path..